Bridgeport is an energetic working-class neighborhood on Chicago's south side, offering way more to visitors than a Chicago White Sox major league baseball game at Guaranteed Rate Field — formerly called U.S. Cellular Field and, before that, Comiskey Park. Because this is one of the most diverse areas of Chicago, you'll discover an incredible variety of authentic cuisine, indelible art and interesting cultural experiences. Thrilling adventures, like helicopter rides and the Chicago Marathon, link this neighborhood with many others throughout the city. Explore the top things to do in the area with our guide, full of the best things to do, see and eat. See the city like you’ve never seen it before — from above. Chicago Helicopter Experience, also known as CHE, is the only FAA-certified helicopter tour company in the city. Founded by Chicago native, Trevor Heffernan, CHE provides thrilling day and evening tours that would impress a local as well as any traveler to the city. Book a private or group tour, available Monday — Sunday throughout the year, and plan on the experience lasting for one hour in total (15 minutes in the air). The best part: the pilots will narrate the tour onboard and give you an educated insight into Chicago’s history, landmarks and architecture. Start the ride from the heliport in Bridgeport and fly over 24 miles of famous Chicago attractions and sites: museum campus, Buckingham Fountain, Navy Pier, Water Tower Place, John Hancock Center, Oak Street Beach, North Avenue Beach, Lincoln Park Zoo, Diversey Harbor, Belmont Harbor and more. The diverse culture in Bridgeport has left a permanent mark on the dining scene — you won’t have to look too hard to find delectable fare. From Mexican to Chinese to Mediterranean to Italian to American to a fusion mixture of delights — it’s all here. Top places include: Franco’s Ristorante, a family-owned Italian spot on 31st street; Bridgeport Bakery, a Polish bakery with trays of sweet and savory pastries and doughnuts; Kimski, a Korean-Polish fusion joint with funky décor, counter service and a well-crafted drink menu; and the no muss no fuss burger and hot dog fast-food staple, Maxwell Street Depot. One of the hippest joints in the area, well worth visiting on an empty stomach, is The Duck Inn. From the outside, the restaurant looks bold in black, and a bit out of place in the neighborhood setting with not a lot around, but on the inside, you’re transported to a retro artsy scene, with antiques, gold sconces, a big beautiful bar and a private open-air patio. The menu is full of creative inspired dishes like Lamb Saddle, Porcini Mushroom Pasta, Duck Fat Dog and a Chef’s Tasting Menu with wine or beer pairings. Romping around Bridgeport at night offers low-key fun, in a community setting, at places that all seem to be named after someone special. Whether you want to belly up at a dive bar, drink a beer at a pub, have a trendy cocktail or sip and snack at the same time, you’ll be rewarded with lots of options in this neighborhood. Highlights include: Irish-American Shinnick’s Pub, located on 3758 Union Avenue; Maria’s Packaged Goods & Community Bar, a neighborhood tavern and store at 960 W. 31st Street that offers craft brews — some that are hard to find elsewhere — and bottled liquor; Bernice’s Tavern at 3238 S. Halsted Street, which has games, pub fare and live music; and Mitchell’s Tap at 3356 S. Halsted Street, which is the place to go to watch a sporting event with locals. If you’re not staying in Bridgeport, and you’re planning on imbibing, plan on having a designated driver—you’ll be between 4-5 miles south of Chicago’s loop. One of the best things to do in Bridgeport is view art—it’s everywhere. 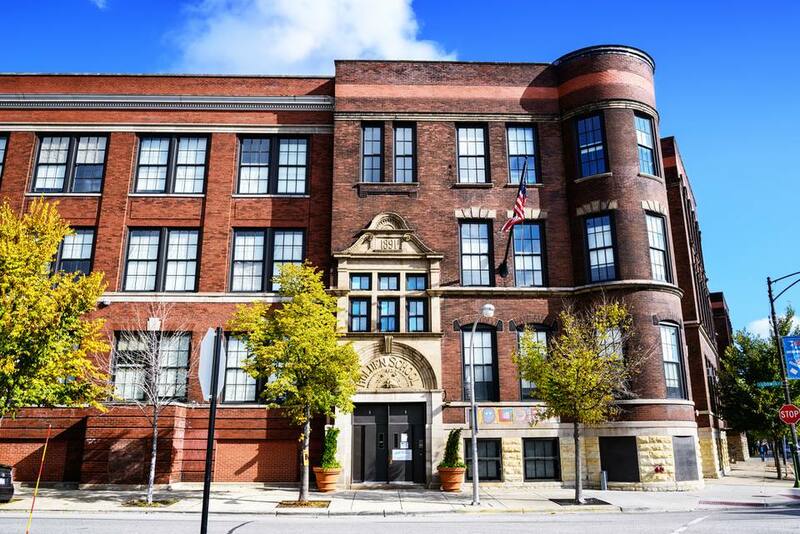 Stop by the Bridgeport Art Center, a large warehouse space full of artists’ studios and galleries, event space and industrial creative work space, at 1200 W. 35th Street. On the third Friday of every month, the public is welcome to peruse the art spaces of painters, sculptors, designers, woodworkers and photographers. You’ll have the chance to not only see newly created art, but also, you’ll get to meet the artists, ask questions and share ideas, often enjoying demos and in-studio special events. Admission, parking and refreshments are complimentary, making the experience social and accessible for everyone. Another art hot spot to explore is Zhou B Art Center, owned by two Chinese-American artist brothers, located at 1029 W. 35th Street. Since 2004, resident artists have been collaborating, creating and curating art, in every medium imaginable, while allowing the public to witness. On the third Friday of every month, you can feast your eyes — and ears — on the main galleries and individual resident studios and indulge in an evening reception from 7-10 p.m. In the heart of Bridgeport, sits Co-Prosperity Sphere, an experimental cultural center that features a wide range of thought-provoking screenings, performances, fairs, installations and exhibitions in its large warehouse gallery space. Lumpen Radio operates in this building. The non-profit, Public Media Institute, or PMI, also finds a home within the space, creating opportunities and awareness for creative endeavors of historically oppressed artists, journalists and creators in a welcoming, safe and uplifting environment. Several events, parties and benefits are held here throughout the year. Bridgeport might not come top of mind when considering places to shop in Chicago — then Magnificent Mile tends to be the first thought — and this is exactly why you should venture out and see what you can find in this south side neighborhood. Gems and oddities abound in this pro-White Sox neighborhood. Walking through the doors of Let’s Boogie Records & Tapes (yes, you read that right — tapes! ), a shop that’s been in business for over four decades, is like taking a trip down your parents’ memory lane. The gigantic vintage vinyl record collection includes jazz, rock, blues, soul and country favorites — some that you won’t find anywhere else. In a fast-moving, ever-changing world, sometimes it’s nice to slow it down a beat. Open every day of the week, Blue City Cycles is your one-stop shop for full-service bike repair and new, used and refurbished bicycles for purchase — Masi, Haro, Del Sol, Schwinn, GT, Linus, Soma, Surly and other brands. A great way to explore Bridgeport is from two wheels, and knowledgeable shop owners Owen and Clare can set you up with everything you need to either get started or fix up what you currently own. Plus, they have a shop cat. The City of Chicago has detailed bike maps that can be utilized for route planning, bike parking and intel on public transportation that allows, and makes room for, bicycles. You can also rent a bike at a Divvy bike station, located at three stations around Bridgeport: Halsted and 35th, Morgan and 31st and Wallace and 35th. Ling Shen Ching Tze Temple of True Buddha School is housed in a beautiful triangular-shaped red building that was built in 1894 by Burnham and Root. Inside the temple are buddha statues, guardians, a massive altar with gold statues and thematic prayer rooms. Devoted to Taoism teachings, patrons may make donations in the name of loved ones and have a dedicated mini buddha statue, representing their well wishes, sit on a shelf in the temple.